Lorraine McConaghy. 2011. 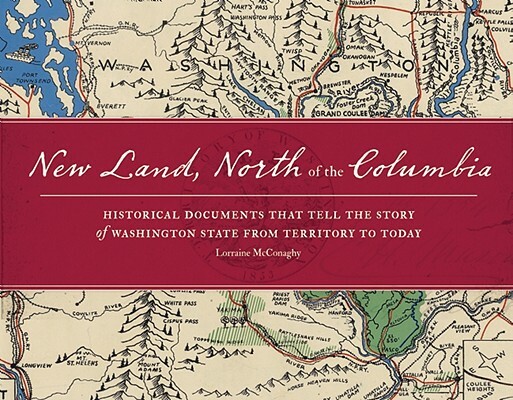 New land, north of the Columbia: Historic documents that tell the story of Washington State from territory to today. Seattle: Sasquatch. Of course I especially enjoyed the Chinook Jargon dictionary (Gill’s) on page 48. But (fortunately), as usual for historical documents, not all the CJ that’s in here is indexed or pointed out. So if you’re alert you’ll also notice a name of interest in the ‘hops farm time book’ for June 1906 on page 32: ‘George cluchman’, that is the wife of George–a clue reinforcing McConaghy’s aside that mostly Native women worked at these farms. You can also see the original ‘seal’ of the Territory of Washington in 1853 spelled our motto as “Al-ki”, with that exoticizing, Indianizing hyphen. I imagine I may find more CJ-related material like this as I keep reading the book. Other things that have already struck my eye, and that give an idea of the breadth of the volume, include ‘water highway to Alaska’ (p.97), ‘Sub Pop grunge’ (p.135), ‘letters of a Spokane prostitute’ (p.42), ‘Riel wedding couple’ (p.74), and the sometimes hilarious vintage postcards (pp.64-65). This is a well-thought-out collection of documents, and I only wish the images of some of them were larger to allow closer perusal! PS–I also notice a photo of bottled Medical Lake water (read my post about Skookum Limechen Chuck), only its label doesn’t have Chinook Jargon on it.